Yes, yes, I know: These don’t sound like they’re on my diet – the one I swear I’ve started. They’re not for me, though, they’re for The Child. We spent a week in Cannon Beach and it was interesting and insanely frustrating to watch her eat. I had no excuses for not cooking for her. I had the time, and we were staying in a rented condo with a perfectly well-stocked kitchen. She ate fish and chips all week, except for the one night she ate pasta and the other night she ate pasta. If you can call it that. I call it Mac ‘n Cheese because that’s what it said on the box. I tossed in some frozen peas to ameliorate my guilt over feeding it to her. I’m a good cook, but she just doesn’t like anything that isn’t on her very, very short list. I let her eat lunch at school in the hopes that she would start eating what her friends do. Every once in a while, she comes home and tells me she tried salmon at school, or something with tofu, but the statement usually ends with “… but I didn’t really like it.” Her friends tell me she eats oatmeal for lunch nearly every day. But a week away from home renewed my determination: I will cook for The Child, and not only will she eat it, she will enjoy it. Vacation is over today, so I made granola bars to put in her lunch. I figured if she’s eating oatmeal for lunch, she there’s a chance that she’ll eat oats that I cooked for her. And if she decides to trade for something else, at least one of her friends will let her know what she’s missing. 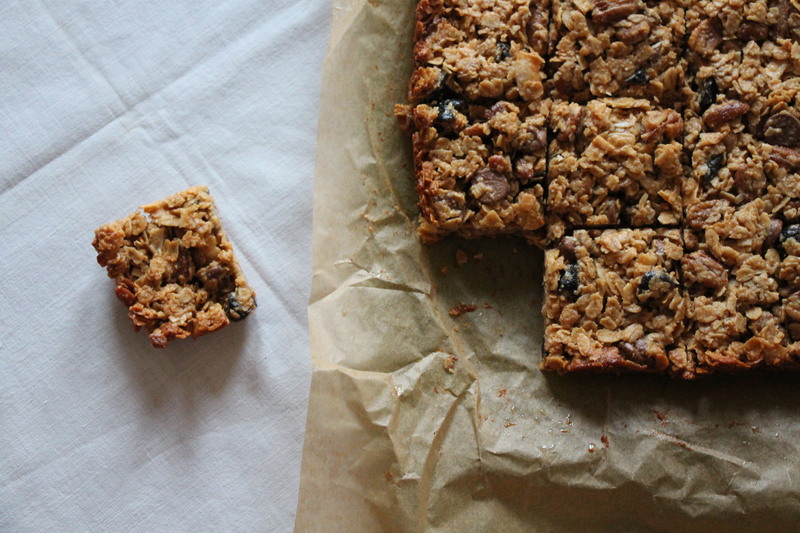 Because these granola bars are made of oats and awesome. I modified this slightly from a recipe I found originally on Orangette, who modified a recipe she found over on Smitten Kitchen, who adapted her recipe from Ina Garten. Such is the way of internet cookery. This version of the recipe is all peanut-buttery goodness wrapped around gooey chocolate and chewy cherries. And oats, to sort of hold it all together. Really, it’s more of a bar cookie masquerading as health food, but I can live with that … if The Child eats it. Preheat the oven to 350°F. Lightly butter a 9-inch square baking pan. Cut a rectangle of parchment paper to line the bottom and two sides of the dish, leaving a little overhang. Press the parchment paper into the dish. Lightly grease the parchment paper. Put ⅓ cup of the oats in the bowl of a food processor. Process until finely ground. In a large bowl, stir together the remaining 1⅔ cup oats, ground oats, sugar, pecans, coconut, chocolate chips, dried cherries, and salt. In a medium bowl, whisk together the peanut butter, vanilla, melted butter, agave or honey, and water. Pour the wet ingredients over the dry ingredients, and stir well, until the mixture is evenly moistened. Transfer to the prepared pan, pressing the mixture firmly to ensure that it molds to the shape of the pan. Bake the bars for about 30 minutes, or until they’re brown around the edges and just beginning to color on top, too. Transfer the pan to a rack, and allow the bars to cool completely in the pan. When cool, run a sharp knife along the edges of the pan; then pull up on the parchment paper to lift the sheet of bars out of the pan. Cut the bars into squares. These look & sound seriously divine ! Heck I may just make it for myself , forget the kids although am quite sure they’ll like it too !! Pecans, oats. cherries, chocolates … yummm !! Pinning it ! sunithi recently posted..How Is Your Diet Affecting Your Oral Health? The kids may appreciate it, but the grownups definitely will. They’re very satisfying!